Good lives take many forms (as do bad ones), and with well over eight million individual stories in the city, a greater variety of experiments in living are to be found in the five boroughs than almost any place on earth. Yet if New Yorkers are to be members of a thriving community rather than a mere collection of individuals, if they are to reap the rewards of diversity rather than be repelled by the rancor of division, then their various and occasionally competing conceptions of how to live must be brought together in a mutually productive arrangement. The mission of the Gotham Philosophical Society is to make such an arrangement a reality. Through public events and online, GPS will bring together philosophers, artists, innovators, community leaders and other concerned citizens in conversations about the central issues effecting life in the city. These discussions will be thoughtful, insightful, and challenging but decidedly nonacademic in tone, for their subject is no mere intellectual matter but that of how are lives are to be lived. The most profound questions we face—about life, love, family, health, education, work, authority, responsibility, and death—are not technological or scientific in nature; no smartphone app is forthcoming that will settle them without prejudice for one and for all. Nor are they questions that any one of us might hope to adequately answer on our own. When we raise them we enter an ambiguous area where, as individuals, we come face to face with the society that has, for better and worse, shaped us; moreover, it is only in the process of answering them that we as individuals and as a society become more clearly defined. How these sorts of questions are framed and answered structure how we live our lives and they are questions that can only be raised and answered by a community in conversation with itself. They are philosophical questions. Philosophical questions have a reputation for being difficult and deservedly so. The challenge they pose, however, is not to answer them correctly but to answer them well. That is no easy task but undoubtedly the best way to achieve it is to ask them well: to ask them in a manner most suitable to the needs and circumstances of the people who are depending on the answers. New Yorkers in the early twenty-first century are not Londoners in the eighteenth century nor Parisians in the nineteenth. Nor are they New Yorkers in the twentieth. Every community and every generation must ask the central questions of living anew and for themselves if they aspire to authentic lives of their own making. Finding better ways to ask ageless questions is the heart of philosophy, and so it is the good fortune of today’s New Yorkers that they count among their neighbors the greatest concentration of philosophical talent in the world. The city’s colleges and universities are home to many excellent philosophers, some home-grown and others intellectual immigrants lured by the city’s vibrant cultural life like so many before them. Students from around the globe set out for the city to study with them, yet beyond the classroom walls they are hardly known, leaving New York’s philosophical community a significant but underutilized resource. 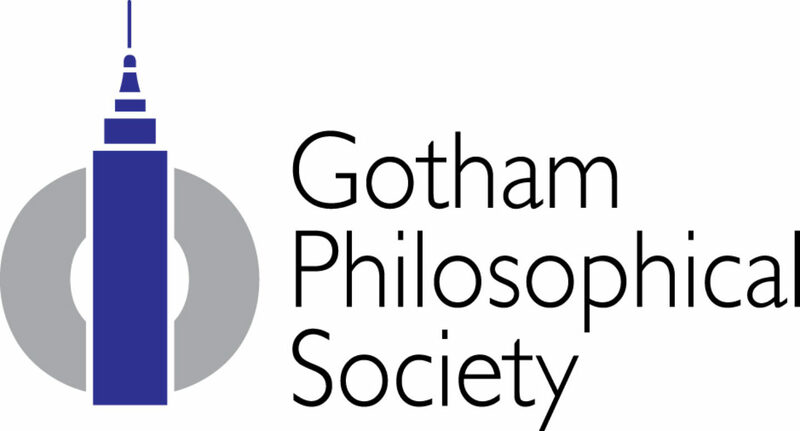 The Gotham Philosophical Society will bring these philosophers into partnership with their neighbors to the benefit of all. Our goal is to make the 21st century the city’s wisest yet.